Our colleagues at the Center for Coastal Studies (CCS) in Provincetown, MA, have been very busy in the last few weeks as their annual spring right whale surveys continue in and around Cape Cod Bay. 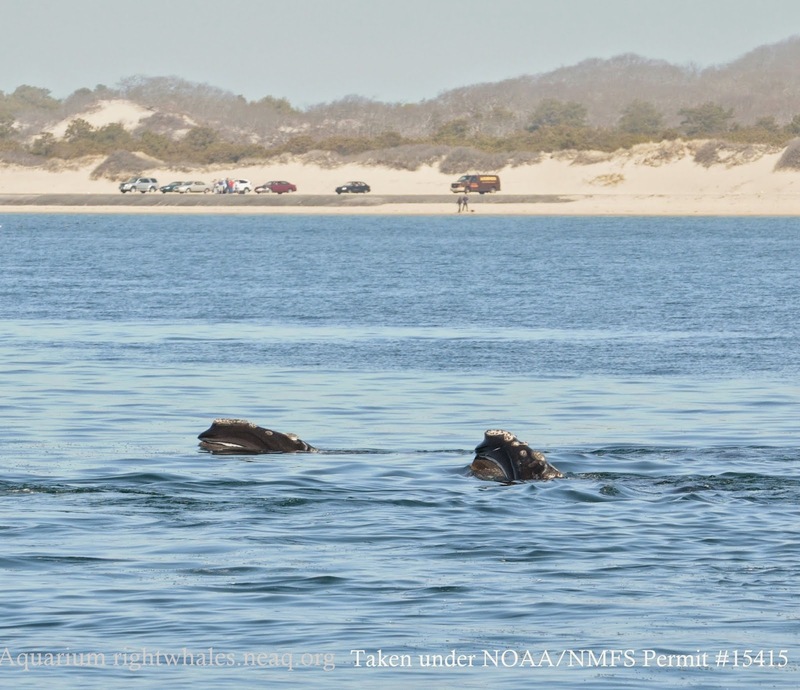 In recent days CCS has reported seeing as many as 100 right whales in the Bay! Most of the whales are feeding at or just below the surface on the high concentrations of zooplankton. If you live in the area you might want to get out to one of the Cape or south shore beaches with a pair of binoculars and start looking--you might be lucky enough to see one of the rarest whales in the world! In among those many whales CCS confirmed the first northern sighting of a 2014 mother/calf pair: Couplet (Catalog #2123) and calf!! They successfully made the long and perilous journey up the busy east coast from the calving ground off Florida and Georgia. Couplet was born in 1991 to Sonnet (Catalog #1123) and has had four previous calves. We hope the pair are soon joined in Cape Cod Bay by the rest of this year's mothers and calves--we always breathe a little easier when they've all returned to the feeding grounds! Learn more about right whales! Want to help this critically endangered species? Sponsor a right whale today! Your support goes directly to the Aquarium's research and conservation efforts. What are those whales doing in Cape Cod Bay?